A guest post by Mark Meyer. It’s 2018 and blogging is all the rage. Over the past few years, more and more people have been starting blogs. There are blogs on every subject you could possibly think of – travelling, health for mature women, extreme sports, and much more. However, it takes some serious creativity, dedication and thick skin to run a blog. Starting a blog is a huge step; it means that you will be exposing your personality, your interests, and even your expertise in the entire world. Many times, this is a positive thing because others will identify with you and become loyal followers. However, there is a nasty side to blogging: haters. Haters are abundant everywhere, but the technological advancements on the internet have made 'trolling' even easier. While your first response to haters may be to take offence or even be embarrassed, this isn’t what you should do. Instead of being afraid of haters, you should embrace them! Your haters are much more important to your success than you realise. Haters, internet trolls, cyberbully...whatever you call them, the fact remains that they have been coming out of the woodwork in recent years. Every year, the amount of internet hate incidents increases. But why? There is a wide range of reasons why haters exist, both online and in person. However, the most common reasons are jealousy, insecurity and anger. When someone – especially someone that you don’t even know – is cruel to you online, the words they say to you are often a reflection of ignorance or pure jealousy. How can you dislike someone that you don’t even know? You can’t! What haters say online are rarely a true reflection of who you are. Sometimes, it’s best to just ignore haters, no matter how cruel they may be. However, there are other times when it’s important that you confront your haters and talk to them. It’s true that having an honest conversation with someone can help improve any situation. But what if you don’t know who the haters are? What if they just have usernames? No problem! With the help of reverse number check you can do a number lookup, name check, and even an email lookup to find social media accounts. All you need is a phone number or email address for someone to reach out privately. 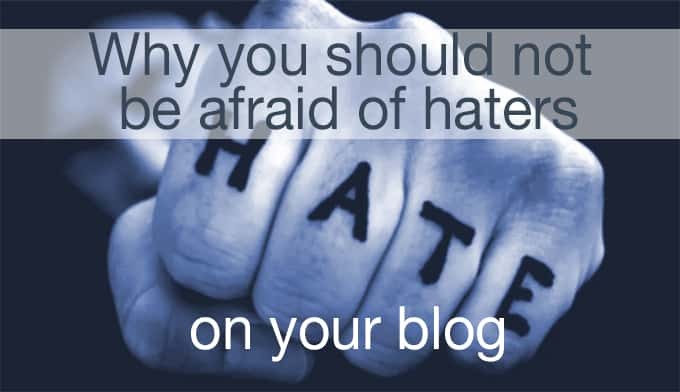 Why you shouldn’t be afraid of haters? Do you know the saying “All publicity is good publicity?” Well, sometimes it can ring true. For instance, say that a hater is spreading rumours about you or bashing your blog. Others will likely see this and want to know more context, so they’ll visit your website. Unfortunately for the haters, as soon as the others visit your website, they’ll see how amazing you truly are. Yes, often haters hate for no apparent reason at all. It’s easy to get defensive when someone is being unnecessarily cruel to you on your blog. However, it can sometimes be helpful to take a step back and truly read what they’re saying. Now, don’t internalise all of their nonsense, but see if there is any constructive criticism in their message. While making those changes is unlikely to make them like you, it can make you feel better about your content. No matter who comments on your blog or what they say, it’s always important to respond to their comments. If you blatantly ignore a rude comment, you will seem cowardly. While you should reply to haters, it’s important that you avoid doing this with hate. Haters give you the opportunity to practice being a gracious person. This means not being overly friendly, but keeping your attitude in check and just stating the facts. The cold, hard truth is that not everyone in your life is going to like you. Whether online or in person, there are going to be people who you don’t get along with – there’s no getting around that. This is why it’s important to not be afraid of haters, but to learn how to deal with opposition and disagreements as early as possible. Haters, who clearly disagree with you for one reason or another, can teach you how to appropriately handle this opposition. One of the most important reasons why you should never be afraid of haters is because they only make themselves look bad. Often they have some problems going on in their personal lives that make them lash out with cruelty to strangers online for no reason. However, the sad reality is that they’re only making themselves look bad. There's no need to be afraid of haters, because you will always look better in everyone else’s eyes than someone who is being mean and childish. Accepting your haters is the best thing that you can do for both your professional career and your personal life. Take what they say with a grain of salt, but accept that you can’t change who they are or what they say. If you took everything that an internet troll said to you to heart, you would be sad and miserable. However, if you let your haters become a learning experience, you’ll be able to become professionally and healthy mentally. The last thing you should ever do is be afraid of haters. However, if you do need to find their information so you can have a civil chat with them, remember about reverse number lookup. Mark Meyer works as the content manager at Spokeo, a service company that offers reverse number lookup. His field of expertise includes business, marketing and self-improvement. In his spare time, he enjoys hiking and surfing.